Welcome to the Fall Prevention Program! 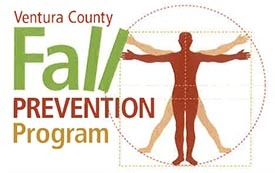 The Ventura County Area Agency on Aging and the Fall Prevention Coalition Partners are aware of the critical effects that falls have on the health of individuals and most especially seniors. That is why we have the Ventura County Fall Prevention Coalition Partners’ program. Below you will find a flyer giving you Fall Facts, Risk Factors and how to make your home safer. For more about preventative measures for falls please check out our videos below and contact us at (805) 477-7343 and ask for the Fall Prevention Coordinator or email us at Fall.Prevention.Program@ventura.org. For more information and schedules for other reputable and effective evidence-based health promotion programs and classes held throughout the county, visit the California Healthier Living Coalition at www.cahealthierliving.org.